The StatTrak toolbar lets you easily navigate around the screens. Use the dropdown menu options at the top or use the quick icon buttons. The Select Teams screen comes up automatically when you start the program. There are two sample teams for you to experiment with. To add a new team, click Teams (lower left). You can add any number of teams to StatTrak. Select Roster from the Update menu to add players to the team. After you've added your teams and players, you're ready to add a game. Enter general game info including: game number, date, location, opponent, and notes. Entering game information is optional. You can enter the score by innings or just the totals. After you've added a game, you can enter the player results. Entering information is optional. The ball icon shows results have been added for the player. Click on the Player Table (row/column) to select a player to update. 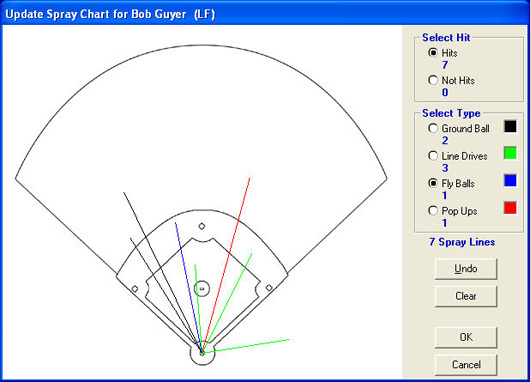 Click the Bat, Pitch, Field or Spray column to update batting, pitching, fielding or spray charts respectively. After you've entered player results you're ready to view reports. All stat reports are automatically generated for you based on the information you've entered in player results. Above is a sample of the Player Statistics Report. You can add individual player pictures in the roster. This makes a great end of season memento. This is a sample Batting Statistics Report. Other reports available are Pitching, Fielding, Spray Charts, Record, Game Scores, Score by Innings, Box Scores, Roster, Lineup and Standings. Click Sort to sort the report by any column. Click Format to add or remove stats shown on the report. Click Minimum to divide the report based on a minimum number of games or plate appearances. Click Compute to compute the report for any combination of games (see screen below). 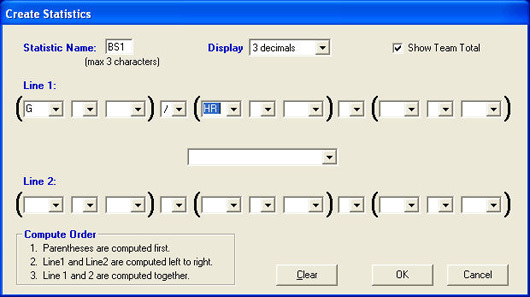 With the Compute Screen you can quickly compute any report for any combination of games. 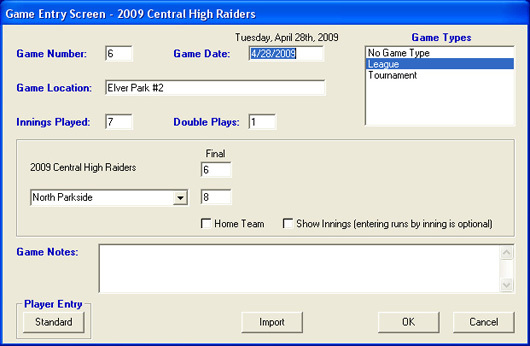 You can rename the report title, select a range of games, select home or away games, select starters or nonstarters, select righty/lefty and runners in scoring position, select game types, select specific players, select fielding positions, and even select individual games. Select Spray Charts from the Reports Menu to display spray charts for the selected team. Select a player, opponents or team total from the drop-down listbox under Select Player. Check/uncheck Hits, Not Hits, Ground Balls, Line Drives, Fly Balls and Pop Ups to display the type you want. The number of spray lines and percentage to the total spray lines are displayed. On the Team Standings Report, teams are listed in order of winning percentage. The report displays Games Won (Won), Games Lost (Lost), Winning or Losing Streak (Streak), Win Percentage (Pct), Runs For (RF), Runs Against (RA) and Games Behind (GB) for each of the teams selected. 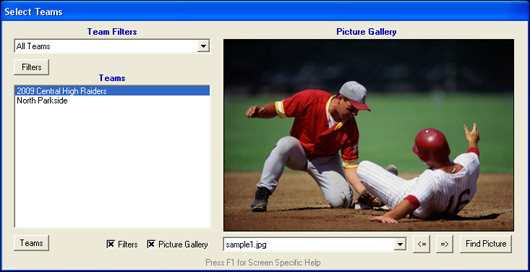 Select Create Statistics from the Tools Menu to create up to five statistics each for batting, pitching and fielding. You can enter a number or select a category in the category drop-down listbox. The Create Statistics Screen is very powerful. Every batting, pitching and fielding statistic in StatTrak for Baseball can be replicated on this screen. Once you've created your own stats, you can add them to your stat reports. One game is displayed at a time for the selected team. Click on the game drop down list to select another game. 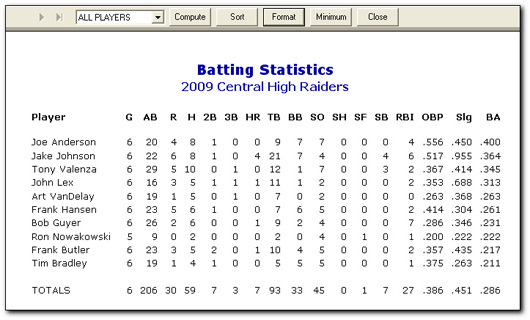 Click Select to choose the batting and pitching stats you want displayed on the report. Here's another choice for you. 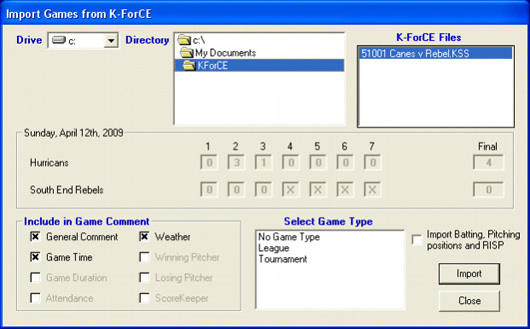 You can score play by play on your laptop using Pointstreak K-ForCE. Then import games into StatTrak for Baseball & Softball to complete your stat analysis with all the reports automatically created in StatTrak for Baseball.